"Legislation belongs to Allah. Democracy is hypocrisy. Hypocrisy in hell." 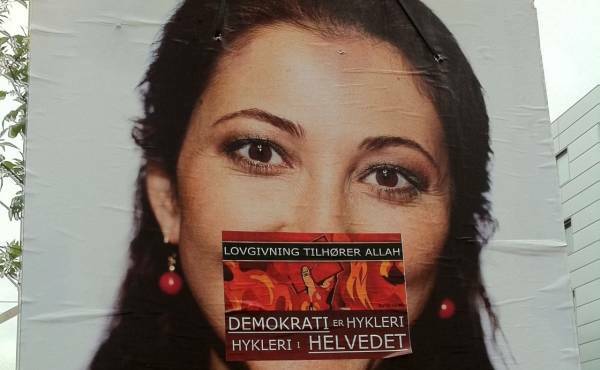 The election posters of several Muslim MP candidates were painted over with Islamist slogans in various districts and suburbs of Copenhagen (Tingbjerg, Nørrebro and Brønshøj). These include Yildiz Akdogan of the Social-Democrats and Özlem Cekic and Kamal Qureshi of the Socialist People's Party. Yildiz Akdogan told Newspaq that she's very upset since she thinks it's an attack against democracy. The politicians say the religiously motivated vandalism was done by people linked to Hizb ut-Tahrir. Chadi Freigeh, spokesperson for the group, denies the accusations and says those are "baseless claims, motivated by an extreme need to get media attention."